The giant of Asia has in recent years become one of the places, at a global level, with the most construction of emblematic buildings. Within China, the cosmopolitan city of Shanghai is one of the epicentres of this architectural development. 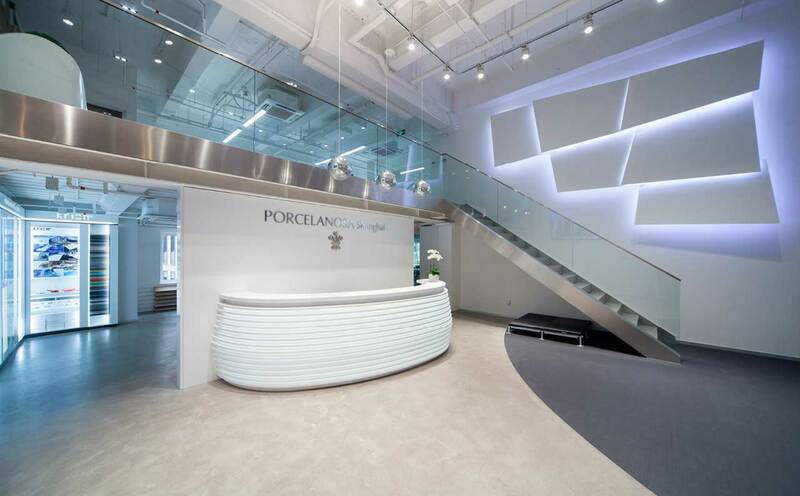 For this reason, in 2012, PORCELANOSA Group opened its first project office in this city, the first step in a fruitful entry into the Chinese market. The new project office – Showroom is made up of two floors and a total of 400m2, located in the district of Huangpu, the area where the largest number of architectural studios are located in the city. Thanks to the work carried out in the three fruitful years since the arrival of PORCELANOSA Group in China, a multitude of projects have been undertaken, notably the skyscrapers of Hotel Sofitel in Haikou and the Zhong Zhou Central Park in Shenzhen. Other smaller ventilated facades also created are the spectacular Vidal Sassoon building and the exterior covering of the renowned brand H&M. All of these were created with KRION®, the Solid Surface from PORCELANOSA Group.